30 Pumps and 15 Power Units reclaim Siberian oil field wastes. SRS Crisafulli. The Tyumen region, Siberia, Russia, is the center of Russian oil production. For many years, well drillers worldwide, including those in Siberia, constructed earthen sumps or ponds to hold waste by-products of the drilling process. The practice is now fallen out of favor and cleanup of old drilling sites has begun. In the Tyumen region, there are hundreds of sites where reclamation of leftover wastes, and cleanup of the sumps, is now mandated. Pumps will perform an important role in remediation projects taking place in Siberia. A Russian oil company is cleaning up the residuals, including drilling mud and chemicals, at well sites in the Surgut area. They hope to reclaim resources in the form of oil from these sites. A Canadian-based oilfield equipment supplier, EPCO Ltd., of Calgary, Alberta, was authorized by the Siberian oil company to source equipment for the reclamation project. After the product evaluation phase was completed, select manufacturers were invited to bid for the order. EPCO chose Crisafulli, known as a manufacturer of engineered dredges, pumps, and power units for sludge & sediment removal, to provide the required hydraulic pumps and power units. The project award was made on March 3, 1997. The customer received fully integrated pumping and power systems. Fifteen Crisafulli trailer mounted, diesel-hydraulic power units act as portable, self-contained power sources. Each Crisafulli Power Unit was equipped with a Perkins 4-cylinder, water cooled diesel engine complete with an emergency safety engine shutdown system. Maximum hydraulic output per power unit is 40 GPM @ 2,000 PSI. Dual flow control valves enable each power unit to run two Crisafulli submersible hydraulic sludge pumps. The harshness of the customer's industrial application dictated use of Crisafulli's rugged duty designs, with each pump constructed of abrasion-resistant (400 Brinell hardness) steel and equipped with a tungsten/carbide mechanical shaft seal to prevent contamination of the hydraulic system. All thirty pumps are three-inch discharge diameter, each capable of transferring 500 GPM @ 15' TDH. Responding to the customer's concerns, the systems were engineered for cold weather starting conditions not unlike those in eastern Montana during early winter (temperatures to minus 40 degrees F, minus 20 degrees C). In June, 1997, Mr. Quinn of EPCO, the customer's designated agent, inspected the systems at Crisafulli's manufacturing plant, and these made in Montana pumping systems were tested and shipped to Siberia. 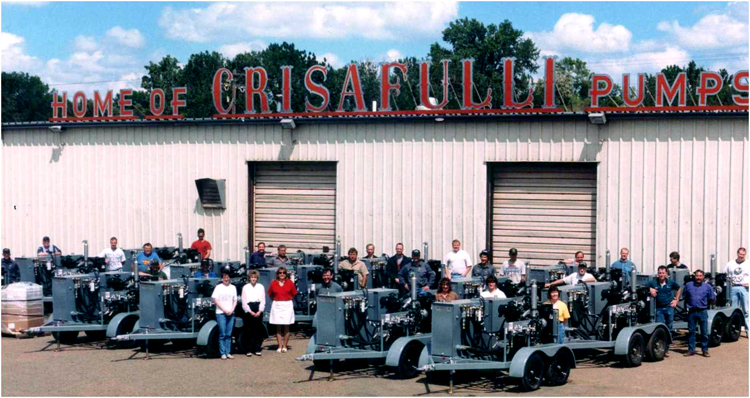 SRS Crisafulli, Inc., founded in 1966, is one of a few select manufacturers of specialized, engineered pumping and dredging systems in the United States. From its beginning, SRS Crisafulli has served agriculture with pumping equipment for irrigation, flood control and dewatering. Read hints, tips and more at the SRS Crisafulli blog series Pumping World News.